Asian Foods Featured with German Wines in BC Liquor Stores this May! Check out these exciting free consumer events pairing Chinese Dim Sum with German wines! Press release below. Vancouver, BC – German wines will share the spotlight with Asian foods in BC Liquor Stores from May 6 to June 2, 2014. 60 stores will feature lively displays of a select 12 German wines, all pairing perfectly with the myriad flavours of Asian cuisines. A FREE consumer event will kick-off the promotion, doling out delectable dim sum with Deutsches wien. What could be more delicious than a crisp, refreshing German Riesling to balance with traditional Chinese Dim Sum flavours? This is what Wines of Germany had in mind when they announced their sponsorship of a month-long thematic within 60 BC Liquor Stores throughout the month of May. German wine Portfolio Manager Barbara Philip selected the 12 wines that will participate in the promotion and local sommelier Mireille Sauvé developed, in conjunction with Wines of Germany, a detailed brochure which will be distributed free of charge at all participating locations. The brochure offers professional tasting notes to guide consumers to their preferred wine style, as well as detailed food pairing suggestions which showcase exclusively the cuisines of Asian regions. Wines of Germany are generally heralded as great food friendly wines. This is a very bold statement, but most sommeliers and other food and wine professionals will agree. British Columbia, being the multi-ethnic province that it is, hosts a wide array of cuisines that virtually reach out for German wines. The not-really secret here is the variety in styles (dry to sweet, sparkling or still), grape varieties (Riesling and Pinot Noir, to name the top ones of either white or red) and the distinct levels of richness (light to full, to honey-like) plus, based on the cooler climate, the wines generally have a good amount of acidity (considered vital for a great food wine) and lower levels of alcohol than warmer climate peers. Visit BC Liquor Stores this April to find your Perfect Pairings. 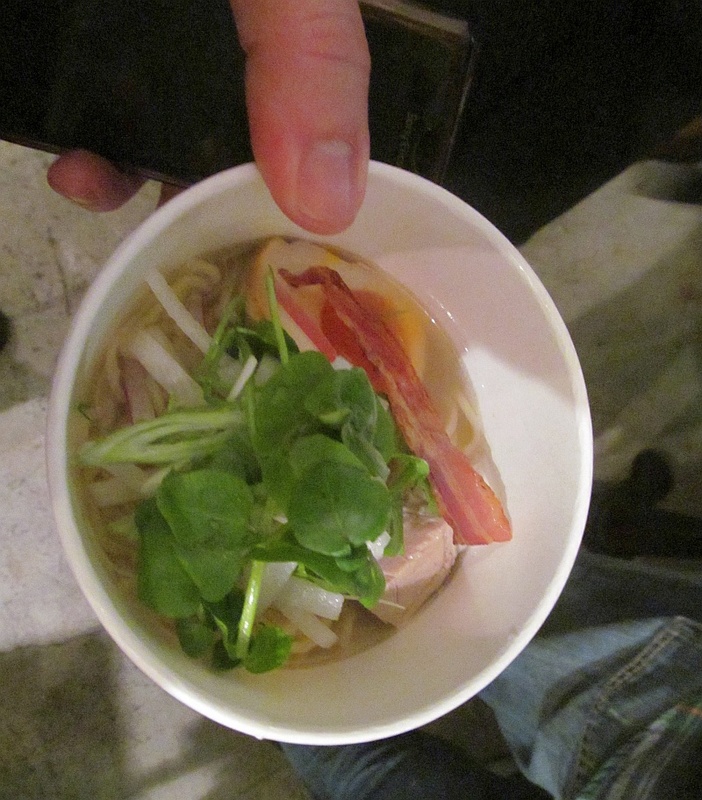 Now here are the details for the next Noodle Mania by Vancouver Foodster! 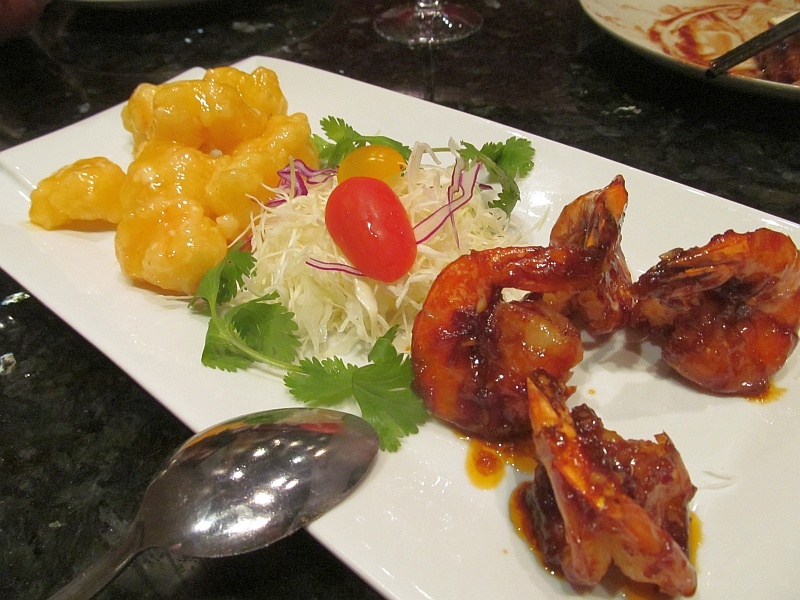 Tantalize your taste buds at several restaurants throughout Vancouver! This tasting extravaganza goes from 1:30pm until 5:30pm and is presented by Vancouver Foodster. You will taste all types of noodles from chow mein to spaghetti to ramen, udon, pad thai and more. Touring many ethnic eateries and tasting noodle dishes from American, Chinese, Filipino, Japanese, Korean, Italian, Malaysian, Singaporean, Thai, Vietnamese, and more. * Vegetarian options will be available at many of the participating restaurants. * Bring along a friend or two, your significant other, your family or come solo. * A food networking event connecting Vancouver’s vibrant food community. * This is an all ages event and everyone is welcome. Registration: TBA -this is where you will show us your printed or digital tickets and will pick up your Noodle Mania Cards. Ticket price includes tasting bowls or plates at each of the participating restaurants throughout the event. Did You Know October 20 is Wild Rice’s 12th Anniversary? Have you ever been to Wild Rice downtown? 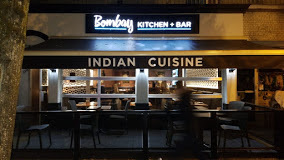 It’s located just to the NW of Tinseltown by the Stadium skytrain station. I’ve been there many times, including twice for Dine Out Vancouver. I didn’t realize the restaurant has been around for 12 years now. And they are having a special anniversary dinner. Details from Wild Rice are below. Enjoy! cauliflower puree, celeriac salad & kohlrabi kimchi. 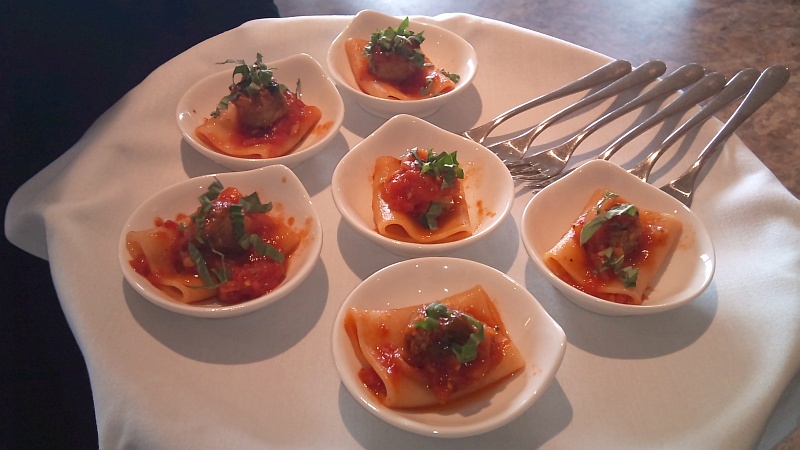 Sen Bistro on Broadway @ Burrard (1788 W. Broadway), has had a soft opening, but last week, they had their official opening with a Media Dinner kickoff. I was fortunate to be invited to attend. 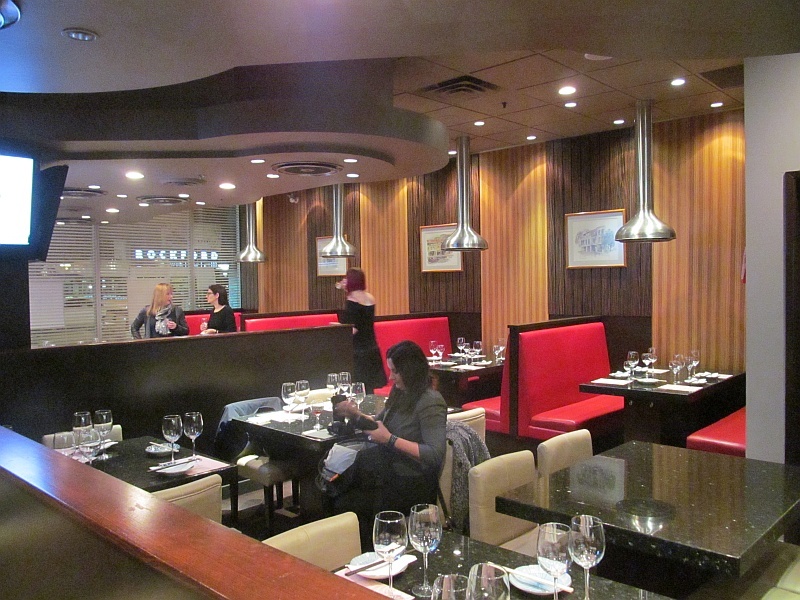 Sen Bistro is the sister restaurant to Chef Zhang‘s nearby Lin Chinese Cuisine and Tea House. 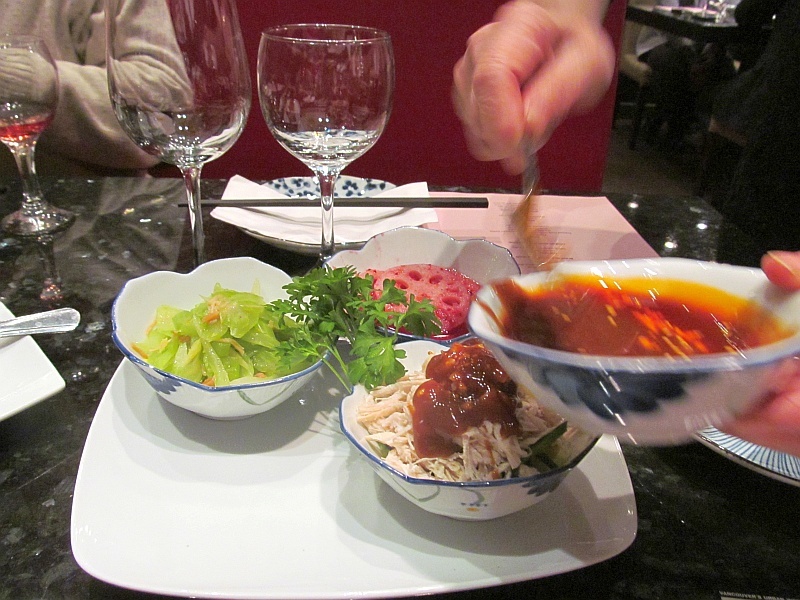 Both feature Northern Chinese cuisine, which is different from the Southern Chinese restaurants that populate the Lower Mainland. I find that the Northern cuisine has more beef and lamb for example, as well as other spices like cumin being used. Chef Zhang opened Sen Bistro so that he could experiment with the Northern Chinese dishes; fusing food or spices from other parts of the world. I think all chefs like to experiment and grow. This evening we also had wine pairings to go with the specific dishes served to us. Another nod to fusion; east meets west. In the reception, I enjoyed the cumin spiced lamb cubes. At first I saw large numbers of dried red chilies and thought that this might be a very spicy dish, but I was quite surprised that it was fairly mild. Also served was a beef curry spring roll. Our wine pairing was a St. Hubertus Rose from the Okanagan. Made from Gamay fruit, this rose burst with red fruit and red cherries. Off dry, it tasted a bit like candy. An OK wine, but may not be everyone’s cup of tea. There was a Salad Trio, was really nice, with contrasts in flavors and textures. The celery & dried scallop and the lotus root dishes were tied for my favourite of the three dishes. The celery was crunchy and I enjoyed the sesame oil taste. The lotus root dish was very different. Thin slices of lotus root, marinated in a Chinese red vinegar, along with some sweet component. So you get crunchy, sweet and sour in each bite. Nice. The pairing for this was a Cono Sur Viognier 2011 (Chile). Cono Sur has been producing some good quality wines for many years. This Viognier was full bodied, nice and round mouthfeel, with lots of tropical and stone fruit. 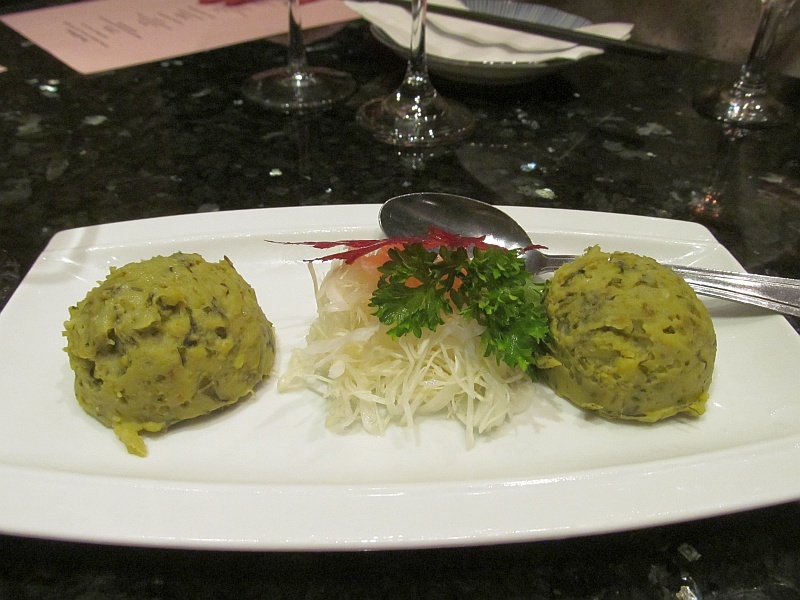 Along with the Salad Trio, we were served a Broad Bean & Sherchai Mash. It looked very similar to guacamole, but different flavour profile. The texture was similar to guacamole, but it was dried, and had a salty and spinach flavour to it. I had never heard of Sherchai, and was told it was similar to spinach. I did a quick search on Google but did not see it; perhaps I should head out to Chinatown to investigate! For hot appetizers we samples a Chicken, enoki & shitake mushroom soup, Lormi Xiaomai, and salt & pepper crunchy tofu. The tofu was fabulous. 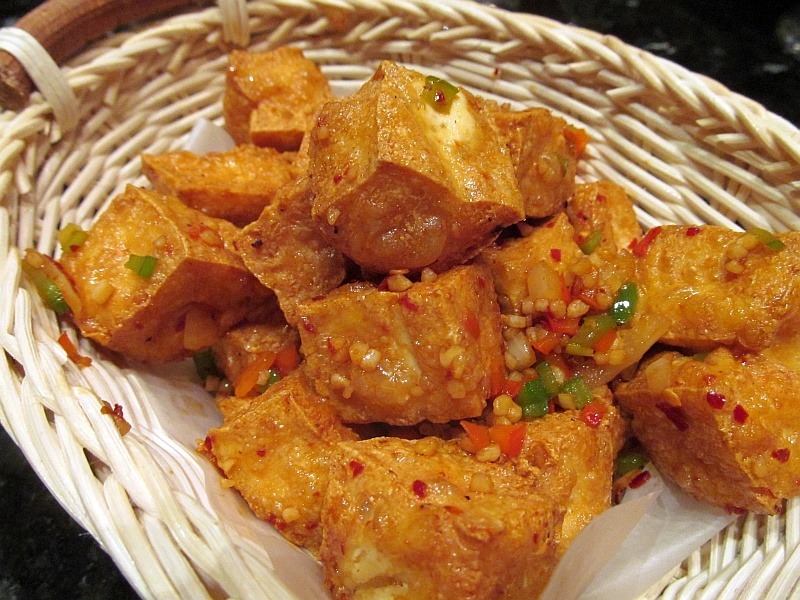 If you like dry ribs and beer, the salt & pepper crunchy tofu would be a great replacement. Nice crunchy outside, spicy from crushed chili pepper, but not too much; just right. 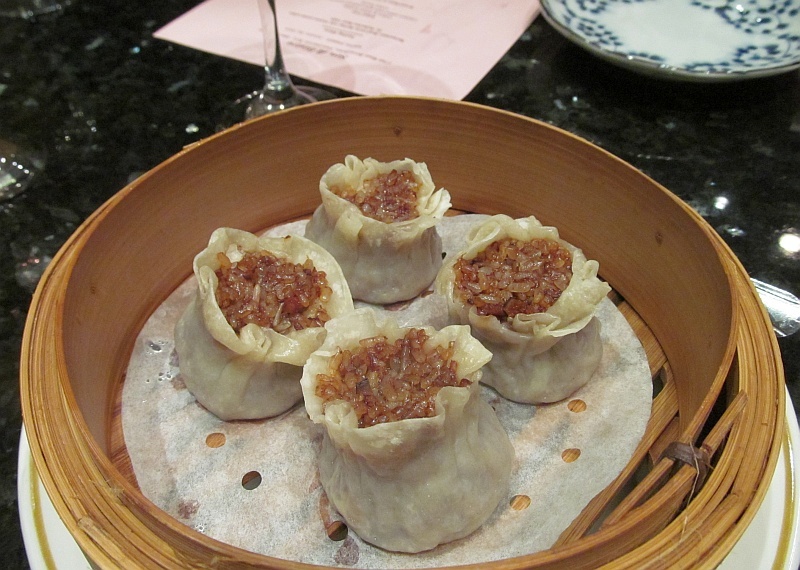 If you have gone for dim sum, you probably have had xiaomai (mixed ground pork and shrimp in a flour wrapper). The Lormi Xiaomai was stuffed instead with sticky rice. I do like sticky rice in lotus leaf. This is a bite size version, sans lotus leaf flavour component. The Chicken with enoki & shitake mushroom soup, was calming. The mushrooms added an earthy component to the soup. There were small chopped green vegetables, still with a bit of crunch to them. 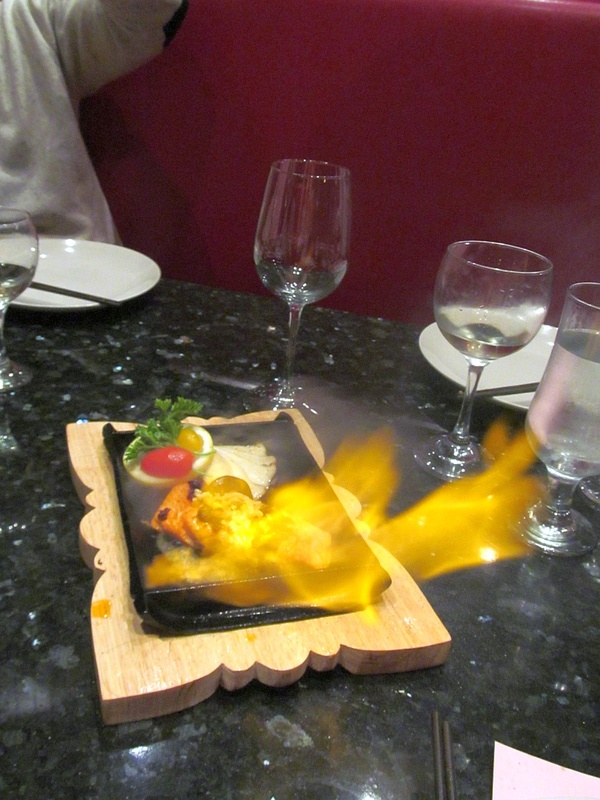 Salmon, the patron fish of BC, was served on a hot plate, then flambeed at our table. The salmon was cooked perfectly, nicely soft in the centre. I really enjoyed the braised pork with pumpkin. The pork belly had nice layering of fat and meat and too that the soybean paste had 5 Spice powder seasoning. The pumpkin slice that accompanied too went well. Nice and soft, and of course matching with the 5 Spice powder (which has cinnamon and cloves). 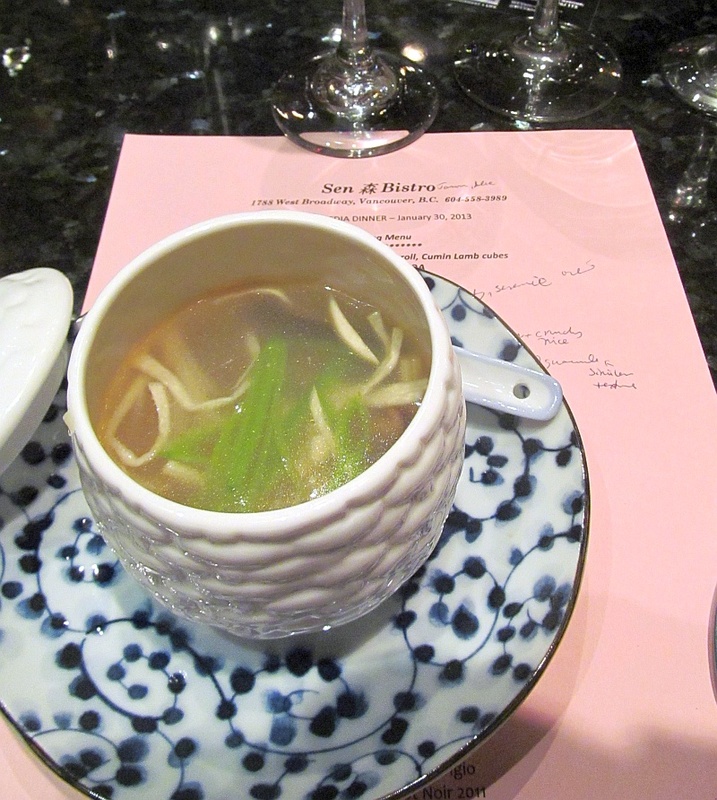 We paired the entrees with a Lucky Star Pinot Noir 2011 (California). The acidity in the Pinot Noir cut through the fattiness of the pork belly. Our table really liked this Pinot Noir. It had flavours of sour red cherries and a hint of violets. Light body, dry with low tannins. The steamed crepes & buns were good to sop up the soybean paste sauce from this dish. The double prawns delight featured prawns cooked two ways; one deep fried and coated with a honey mustard sauce, and the other wok fried with a smokey / sweet / chili sauce. I preferred the latter, but several people at my table also liked the honey mustard version. 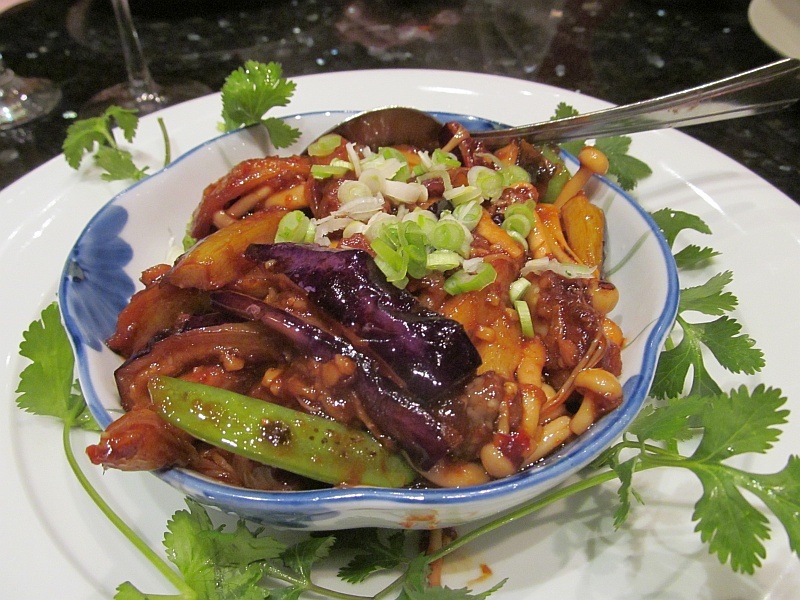 The last dish was the wok-fried vegetables, mainly consisting of thin slices of eggplant, mushrooms, and scallions. It was spiced with ginger and sauteed. Quite tasty. There were two desserts. The first was “pumpkin sticks“, but it was more than just a “poki” style stick that you see at T&T. To this there was a yellow yam? 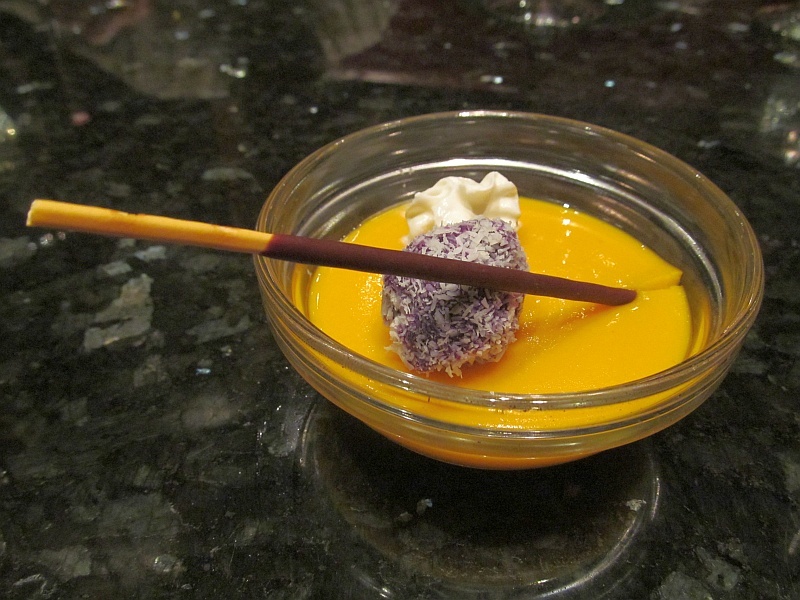 pudding topped by a purple yam ball coated with dried coconut. The purple yam ball was a hit. The pudding was also good, not too sweet, but may be bland to some people not familiar with Asian style desserts. The other dish was the blackbean paste Lormi-zhi. 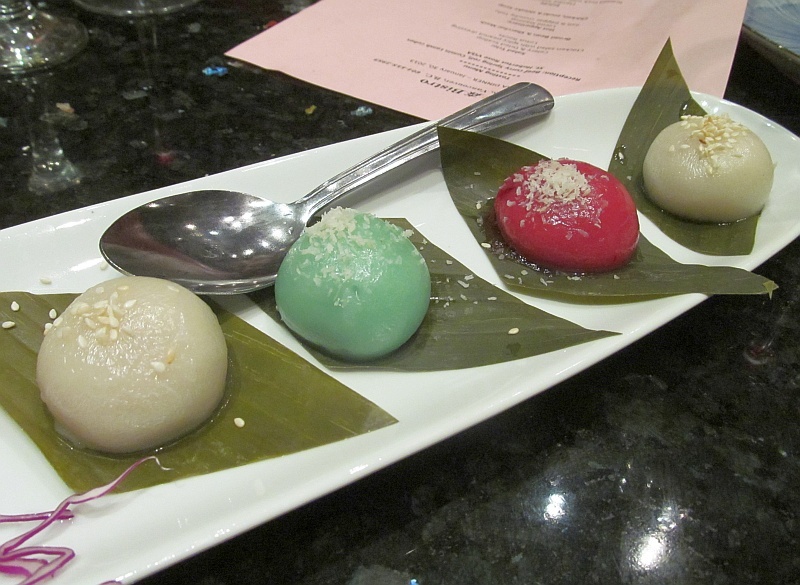 We were presented with what appeared like Japanese mochi balls, that were each in a different colour. Each one had a different filling. One was the traditional blackbean paste, while another that I tried had 3 types of chopped nuts (peanut, cashew and almond I think). I wish Chef Zhang best of luck in his new endeavor at Sen Bistro. OK, the holiday season is over and all our binging. It’s time to treat our bodies better in 2013. One way is to learn how to make some healthy and delicious vegetarian Chinese dishes at Wild Rice restaurant in New Westminster. It is easy to get to Wild Rice. Hop on the Expo line skytrain and jump off at New Westminster station. Here is the announcement that showed up in my email box. Enjoy! Executive Chef Todd Bright is featuring Vegan Chinese in his cooking classes this month at the New Westminster location. Value priced at only $30, the fee includes the class (both demonstration and hands-on) followed by a four-course dinner. It does not include tax, gratuity or beverages. Classes start at 6 p.m. every Tuesday this month starting January 8th. Please contact caroline@wildricebc.ca or call 778-397-0028 to book your seat. Noodle dishes are popular around the world. 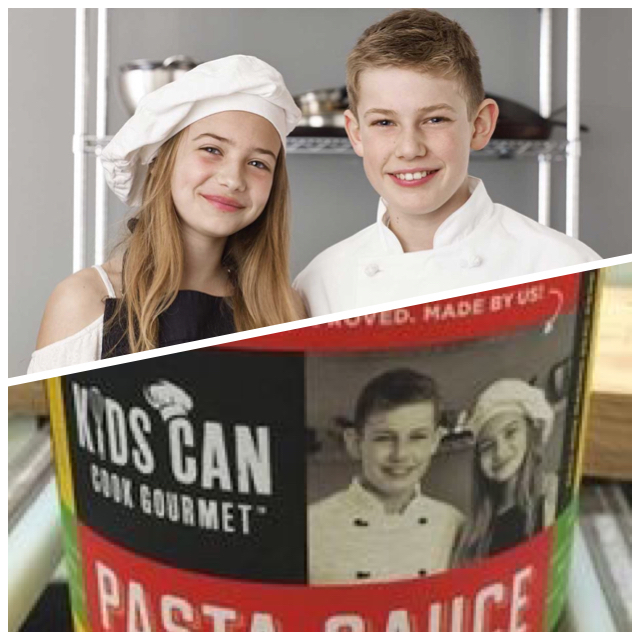 There are many variations on the sauce (e.g. hot, sour, spicy,tomato-based), the type of noodle (e.g. wheat or rice), and the protein with it (e.g. fish, meat, tofu). With all these variables there are probably several thousands of variations, and proabably a few that you prefer. Vancouver Foodster’s “Noodle Mania Vancouver” will give you a chance to try noodles from many cultures. Try some that are new to you. Maybe they will be your new favourite. The Noodle Mania Vancouver is on January 13, 2013 from 3-8pm. Pre-Sale pricing special offer of $20 each ticket is now thru December 4th. Here is the press release. Advance Tickets: $35 per person (eventbrite fee extra). $100 for 4 pak of tickets or $135 for 6 pak of tickets (get a group of your friends/family together and save by purchasing a 4 pak or a 6 pak (eventbrite fee extra). Tickets $45 per person (eventbrite fee extra) after January 10th. 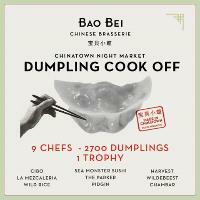 Ticket price includes tasting bowls or plates at each of the participating restaurants throughout the evening. A donation of $3 from each ticket purchased will go to support Project Limelight Society. 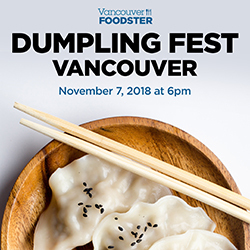 Vancouver, BC – Prepare to experience some of the newest and tastiest offerings on Sunday, January 13 from 3 to 8 p.m. as Vancouver Foodster, Vancouver’s essential online food and drink guide, presents “Noodle Mania Vancouver”. 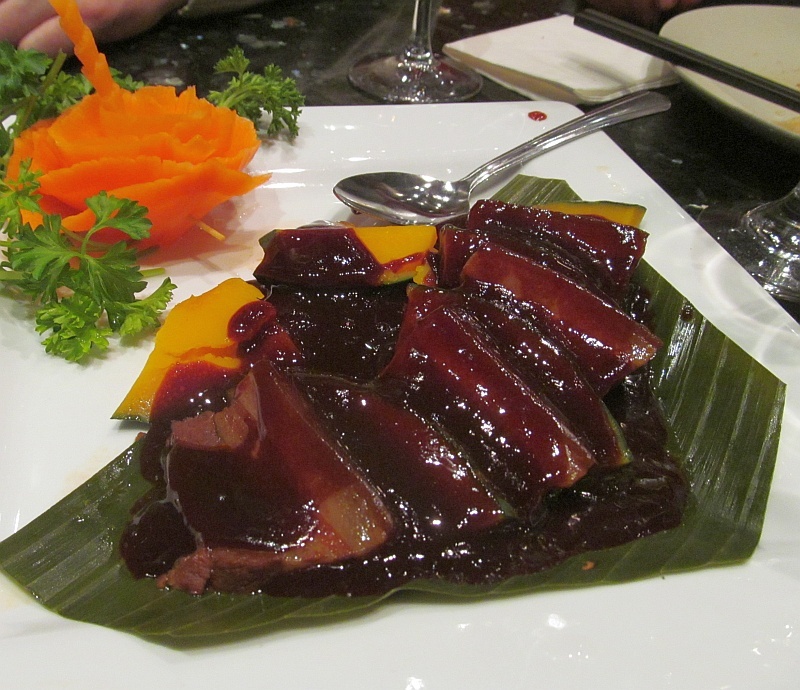 Tantalize your taste buds at several restaurants throughout Vancouver! This tasting extravaganza goes from 3pm until 8pm and is presented by Vancouver Foodster. Guests will taste all types of noodles from chow mein to spaghetti to ramen, udon, pad thai and more. Touring many ethnic eateries and tasting noodle dishes from American, Chinese, Filipino, Japanese, Korean, Italian, Malaysian, Singaporean, Thai, Vietnamese, and more. Each restaurant will be serving up Tasting Bowls or Plates for guests to enjoy and they will have a chance to visit many different types of restaurants throughout the event, meet some new food loving friends, meet the chefs, and learn about each of the participating restaurants. 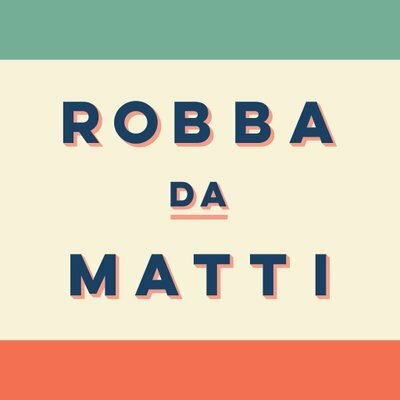 The event is a roving tour that brings guests to the participating restaurant throughout the event and they will by moped, bike, driving, transit, walking, roller skates, skateboarding or carpooling to the various participating restaurants. Chau Veggie Express at 5052 Victoria Drive specializes in Asian veggie noodle dishes and they will be participating along with Urban Thai Bistro at 1119 Hamilton Street who specializes in Thai noodle dishes! These are just a couple in the line-up of participating restaurants that will be revealed soon. Registration: tba-this is where you will show us your printed or digital tickets and will pick up your Noodle Mania Cards. Pre-Sale pricing special offer of $20 each ticket is now thru December 4th. Advance Tickets: $30 per person (eventbrite fee extra). $100 for 4 pak of tickets or $120 for 6 pak of tickets (get a group of your friends/family together and save by purchasing a 4 pak or a 6 pak (eventbrite fee extra). Tickets $40 per person (eventbrite fee extra) after January 10th.